The bird world has its bullies, too. Meet the South Polar Skua, a predatory seabird. During summer in Antarctica, South Polar Skuas feed their young on the chicks of other seabirds. And once their breeding season ends, the skuas fly to northern oceans, such as the North Atlantic, to find large flocks of shearwaters, gulls, or terns - there to steal the food of their fellow seabirds. The world of birds has its bullies, too. Take for example the South Polar Skua [SKOO-ah]. 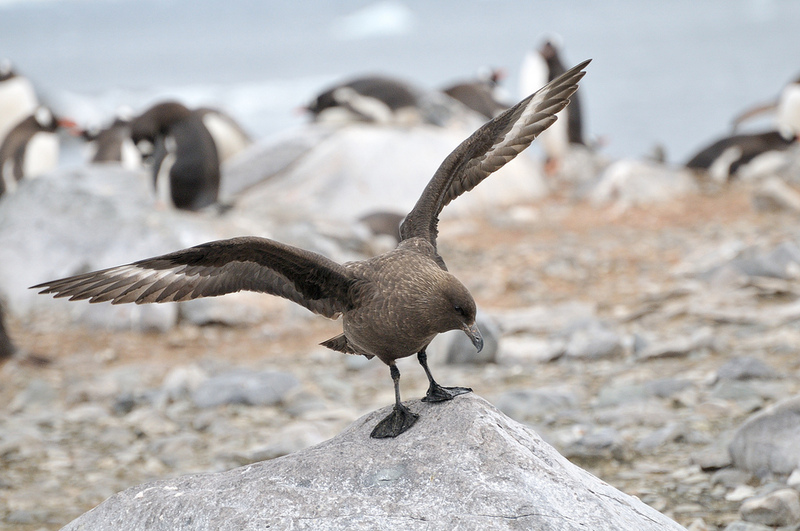 Once their breeding season is finished, South Polar Skuas will then fly all the way to northern oceans, such as the North Atlantic, to find large flocks of shearwaters or gulls or terns. [Call of Cory’s Shearwater] They hang out along the periphery waiting for those birds to find food. For a look into the world of seabird surveys, begin at our website, BirdNote.org. Call of Cory’s Shearwater xeno-canto 145489 recorded by B. Steffen. Ship moving through water recorded by Kessler Productions. Ocean surf Nature SFX Essentials 26 recorded by Gordon Hempton of QuietPlanet.com.